Just as the Chicago Tribune announces its own bankruptcy, it runs an editorial which demonstrates its political bankruptcy as well. 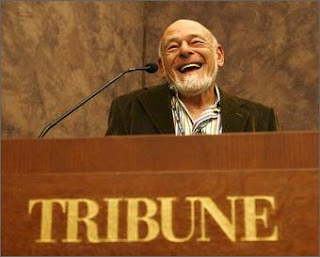 As billionaire Sam Zell takes down the Trib, I guess he wants to push the same failed corporate model on public schools and bring them down with it. The Trib wants Obama to pick a secretary of education based on the Gen. Shinseki model. But since Shinseki is already taken, Arne Duncan or Joel Klein will have to do. Zell's editorial writers can't help but repeat the same old nonsense about Duncan/Klein being the "reformers" while Linda Darling-Hammond is portrayed as "someone reluctant to smash skulls." What a telling metaphor for ownership-society reform. Also see Roger Ebert's teriffic piece, "Trib bankruptcy a Zell of a deal."